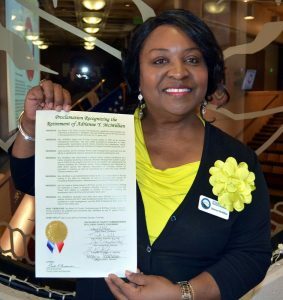 Adrienne McMillian was honored by the Board of El Paso County Commissioners at its regular meeting on Thursday, June 28, marking her retirement from the El Paso County Department of Human Services after 21 years. McMillian began her El Paso County career in 1997 as an income maintenance technician, and was swiftly promoted to supervisor in 1998, subsequently supervising several areas including food assistance, family services, Colorado Child Care Assistance Program and adult programs. Most recently, she worked as Colorado Works case management supervisor. “She cares about staff, she cares about the community and she cares about families,” said Cheryl Schnell, DHS Adult and Family Services Director.